Is this 3D monitor worth the extra money? Will the Acer GD245HQ add an extra dimension? The GD245HQ's 120Hz refresh gives a glimpse of a smoother future. But not quite worth the asking price. Whether it's gaming or movies, it seems the whole world is going mad for stereoscopic 3D. 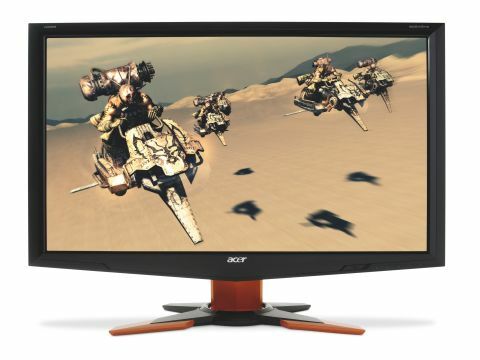 With that in mind, the 3D-capable Acer GD245HQ is probably the monitor of the moment. By most metrics, it's a pretty ordinary panel. It's a 24-incher with a TN panel, a CCFL backlight and the standard-issue 1,920 x 1,080 HD pixel grid. None of that would necessarily be bad if it weren't for the minor matter of pricing. The Acer GD245HQ is knocking on £300. That makes for a tough sell compared to similarly proportioned panels available for over £100 less. Some, such as the BenQ EW2420, even have VA panels and LED backlight. What they do not have, however, is support for stereoscopic 3D. Of course, for 3D visuals you need some additional kit, such as Nvidia's GeForce 3D Vision. That adds another £125 to the overall figure required to enable 3D visuals. Whatever you think about stereoscopic 3D, it doesn't come cheap.